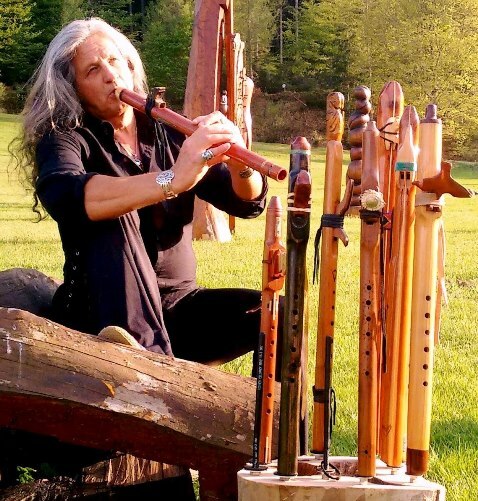 Native American Flute Player/Award-Winning Recording Artist, Wolfsheart, performing for a variety of functions from concerts, conventions, multicultural events, festivals, churches, schools and encampments. He also offer a dynamic and informative children’s program. We use BandsInTown to embed facebook events into our website. This plugin uses the following cookies: facebook connect, ScoreCard Research Beacon, Google Analytics, Facebook Custom Audience and Facebook Pixel. According to our information, your anonymous data will be shared with third parties. We do not collect personal information in the context of the BandsInTown embed. We use so-called social plugins („plugins“) of the social networking site facebook.com provided by Facebook Inc., 1601 S. California Ave, Palo Alto, CA 94304, USA (“Facebook”). Due to the integration of the plugin Facebook collects the information that a user is visiting the corresponding website. If the user is logged in on Facebook at the moment he or she visits the website, Facebook may be able to connect the visit on the website to the user’s Facebook account. If the user interacts with the plugin – for example if he or she presses the like button or comments on something – the user’s browser transmits this information to Facebook. Facebook stores this information. If a user is not a member of Facebook, Facebook may collect and store the user’s IP-address. Facebook states that it only collects anonymized IP-addresses in Austria. The reason for and scope of the data acquisition and information about the way in which the data is processed and used by Facebook, as well as the user’s rights in this respect and settings options for protecting the users privacy can be found under: www.facebook.com/policy.php. You have the right to request information about which data is processed (Art. 15 GDPR), to complete incomplete data as well as to have incorrect data corrected or deleted (Art. 16, 17 GDPR). A right of cancellation does not exist if the processing is necessary to fulfill a legal obligation or to assert, exercise or defend legal claims. Under certain circumstances, you may also request the restriction of the processing of your data (Art. 18 DSGVO) as well as the processing of your data (Art. 21 DSGVO). You have the right to receive the data that you have provided in a structured, common and machine-readable format and to transmit this data to another person responsible (Art. 20 DSGVO). If your data is processed on the basis of your consent, you have the right to revoke this consent at any time. The revocation does not affect the legality of the data processing up to this revocation. When you call up a page of our website, your browser makes a direct connection with Google servers. Google thus becomes aware that our web page was accessed via your IP address. The use of Google Web fonts is done in the interest of a uniform and attractive presentation of our website. This constitutes a justified interest pursuant to Art. 6 (1) (f) DSGVO. For uniform representation of fonts, this page uses web fonts provided by Fonticons, Inc. When you open a page, your browser loads the required web fonts into your browser cache to display texts and fonts correctly. When you call up a page of our website, your browser makes a direct connection with Fonticons servers. Fonticons thus becomes aware that our web page was accessed via your IP address. The use of Web fonts is done in the interest of a uniform and attractive presentation of our website. This constitutes a justified interest pursuant to Art. 6 (1) (f) DSGVO. Further information about handling user data, can be found at fontawesome.com/help and in fontawesome.com/privacy” . the browser used by the user, the operating system, the interface, the language of the browser and the version of the browser software. This information is stored on our web server in a so-called log file (in a “logfile”). Due to the shortened IP address, it is not possible for us to establish a personal reference. Storage in log files is done to ensure the functionality of the website. In addition, the data is used to optimize the website and ensure security. An evaluation of the data for marketing purposes does not take place in this context. This constitutes a justified interest pursuant to Art. 6 (1) (f) DSGVO. The log files are stored for a period of 190 days. The plugin “iThemes Security” makes useful and sometimes indispensable precautions to ensure the security of this website. This checks whether the user is identical to an attacker from the list in order to immediately and irrevocably exclude him from using this site. The synchronization takes place locally on this server, no IP addresses are forwarded to external servers. The IP address of the user is not stored. Access to our website is monitored by “iThemes Security”. Unauthorized access attempts are stored in our database including IP address for 14 days and then deleted. In the case of several unlawful access attempts, storage and blocking of the IP is planned beyond this period. Our site contains links to external websites over which we have no control. Therefore we can not accept any responsibility for their content. The respective provider or operator of the pages is always responsible for the contents of any Linked Site. The linked sites were checked at the time of linking for possible violations of law. Illegal contents were at the time of linking not identifiable. follow-up will be stored for six months. We will not foward or sell personal data to third parties.